Kinwashkly Meadowlark, JH "Meadow" Whelped: 08/04/03. OFA GOOD, Elbows: Normal. OFA # BS-13202G33F-PI. DNA Profile #: V557681. By DC The Whiz Kid x Canadian DC Kinwashkly Sunshine Girl. Both parents OFA excellent. Breeder Leslie Andreas. She was (as with all our dogs) a mixture of Dual Champion field and show lines that HUNT! Meadow was a medium sized female with medium bone. 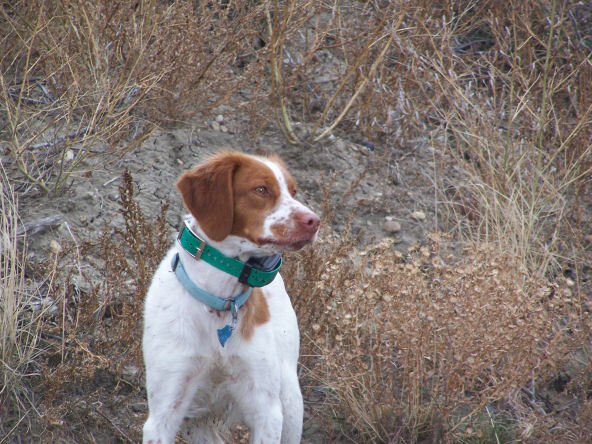 She is very birdy and intense as a hunter and had long gun dog range. She was a mellow couch potato in the house but a fire cracker in the field. She enjoyed agility and Sari enjoyed handling her through her paces. Med had finished her Junior Hunter title, had pup and derby field trial placements, and was show pointed. She hunt, hunt, hunted!!! She had a great touch with covies of huns and sharps... She spent her last years enjoying hunting with my 80+ year old father in WA. She is always missed. 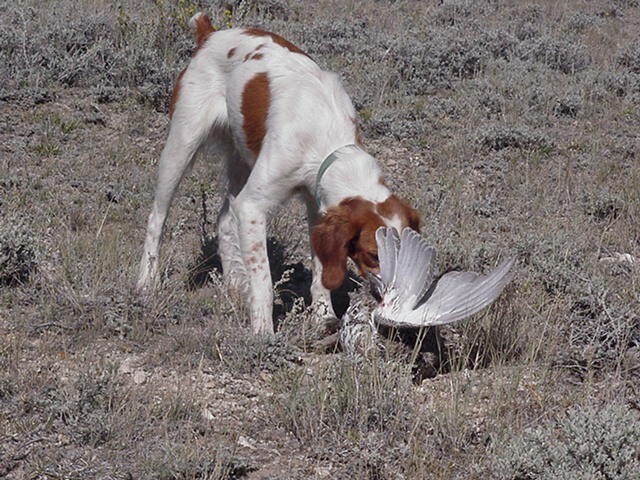 Meadow fetching her first Montana sage grouse, '04.